Enjoy perfect relaxation and comfort in your bathroom with GROHE’s New Tempesta 100 hand shower. The showerhead features two spray patterns – choose between the relaxing Rain spray that creates the sensation of warm summer rain, and the powerful, revitalising Jet spray depending on your mood. Our GROHE DreamSpray technology ensures an even flow of water from all nozzles, and when you are finished our SpeedClean anti-lime system makes cleaning any limescale residue from the silicone nozzles easy to clean with just a swipe of your finger. The shower comes in the dazzling and durable GROHE StarLight chrome finish while a ShockProof silicone ring protects the hand shower from damage if dropped. 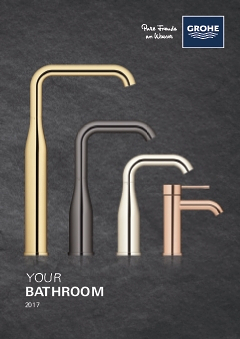 For a bathroom experience where style meets perfect practicality, choose GROHE’s New Tempesta.